Kim Kardashian Hits Back At Critics Who Called Her Wedding "Fake"
Says marriage was "a bad business decision." Kim Kardashian said her marriage wasn't fake. 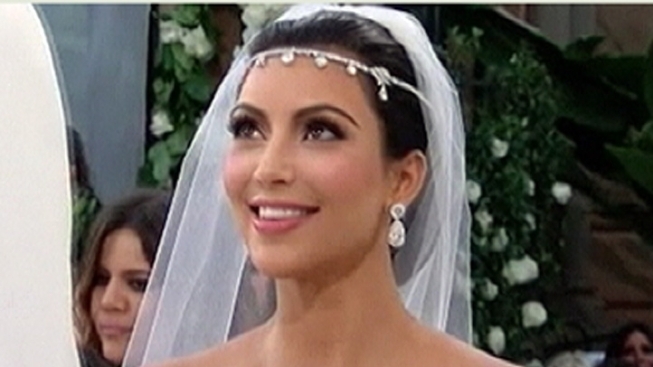 Kim Kardashian is hitting back at suggestions her marriage to Kris Humphries was inauthentic. "If you really think about [it], if this was a business decision and I really made all that money that everyone was claiming that we made off this wedding, and if the wedding was fake and just for TV — I'm a smart businesswoman, I would have stayed married longer. This was a bad business decision," Kim said as she cohosted "Live! with Kelly" with Kelly Ripa on Monday. "If you really think about it, it doesn't make sense that everyone says that," Kim continued. "I really didn't think that following my heart would create this much backlash." Kim admitted she has been watching how her marriage fell apart on the most recent season of "Kourtney and Kim Take New York" on E!. "I watch it back because I think that it's kind of therapeutic," she said. The reality star said it has been a "hard couple of months," since her split, but she doesn't blame herself for falling in love so fast, especially because it worked so well for her mom, Kris Jenner, who Kim said married Bruce Jenner after a 5 month courtship, and her sister, Khloe Kardashian, who tied the knot with Lamar Odom after an even briefer dating cycle. "I thought I could do it," Kim said. "I'm a hopeless romantic. I fell in love and I thought it could work just like the examples that I saw." Moving forward, Kim said she remains optimistic. "I think I learned that I just really need to rewrite my fairytale," she said. PLAY IT NOW: Access Hollywood Live: Kendall Jenner - Which Kardashian Sister Gives The Best Advice?